The House Rabbit Network is holding our annual spring Yankee Candle fund raiser. Yankee Candles make wonderful gifts and are even great for your own home! Please consider making a purchase. You must live in Eastern Massachusetts to purchase Yankee Candles for this fund raiser. All items are delivered to our organization, and with the heavy weight of candles, we cannot ship them. Payment is due when we receive your order. There are no handling charges or taxes. You may view their catalog online and email us at info@rabbitnetwork.org with ordering information. Someone will get back to you confirming your order and to arrange payment. Please click on the image above to view the online catalog. Yankee Candle offers a myriad of lovely products for sale: candles with Illuma-Lid toppers specifically designed to reduce the effects of drafts, allowing the candle to burn more efficiently; hand painted Butterfly Crackle glass candle accessories; a variety of attractive gift sets; vegetable & garden seed mats, for example “Gourmet Popcorn Seed Mat” and “Butterfly Garden Mat”; hanging strawberry, cherry tomato, and flower kits; odor eliminating room sprays, reed diffusers and car fresheners. Do not forget Mother’s Day is on May 10th. So, why not plan ahead and have that 40% profit of those purchases go to a really great cause, one that we all feel passionate about…..THE BUNNIES! Delivery is approximately 4-6 weeks after the sale ends. HRN Ed Day @ Peabody PETCO – We’re Back!!! 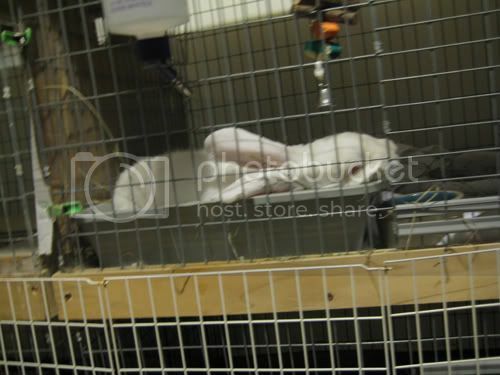 As some of you may recall, HRN had suspended doing education days at PETCO stores because they began selling rabbits. Well, PETCO finally realized the error of their ways and has changed their philosphy back to “adoption first”. This in itself was welcome news, but even better was that the Peabody PETCO assistant manager, Stacie, called us up to see if we would be interested in resuming our Ed Days with them. Stacie, as well as the store’s general manger, Scott, were extremely cooperative with us and even donated 60 lbs. of rabbit pellets to HRN. Scott also invited HRN to become a partner of the PETCO Foundation which entitles HRN to be a recipient of a portion of the proceeds generated through in-store fundraisers at his location. So this past Saturday, February 21st, HRN volunteers Robin, Barbara, Tricia & Tom, with special help from Robin’s daughter Francie, held an education event from noon to 3:00 PM. Thanks to you all for donating your time! We also brought along HRN bunny Robin, who was one of the eight bunnies rescued last year when they were dumped out of a car on I-495. Robin did a wonderful job representing HRN as well, but even better, she was adopted. She has found her forever loving home! The store traffic was steady and we were kept busy all afternoon spreading the word about HRN and its mission. We handed out lots of literature, collected a few donations, sold a calendar, and even had a few serious inquiries (we hope) about future adoptions. 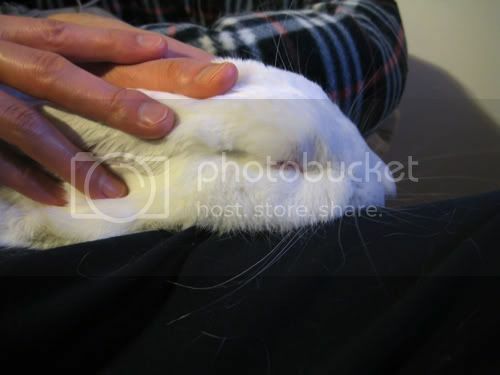 Several people asked about the compatabilty of rabbits with their other pets and we gave them copies of HRN articles on the subject and stressed that rabbits are usually pretty flexible with other animals, but as always, a few supervised bonding sessions is the only true way to find out if the different animals can get along. All in all, it was a productive day, and we look forward to returning to the Peabody PETCO again in the near future (date TBD). February is Adopt A Rescued Rabbit Month!!! Comments Off on February is Adopt A Rescued Rabbit Month!!! This month, we celebrate rescued rabbits everywhere. If you’re thinking of adopting, please contact us at 781.431.1211, and one of our Hotline Volunteers would be happy to speak to you! You can also email us at info@rabbitnetwork.org. Every little thing that we can do, even by simply hanging a flyer, will help us, help the rabbits in the care of the House Rabbit Network! I am going to tell you why people should adopt – or at the very least – get involved. I am going to get a bit serious here. When you adopt from a rescue (like HRN) or a shelter – it saves the life of a bunny. This issue is avoided / ignored / unknown by many people. If you are at this blog – then you are probably aware of this important fact. 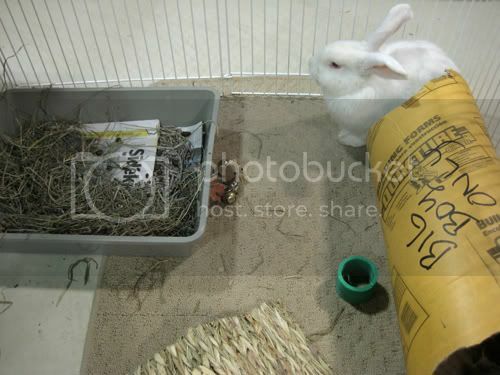 Every time a bunny is bred for sale, a shelter rabbit dies. There is only so much space and demand. It is sad- but it is why I do everything I can to help the discarded bunnies of this world. Fifteen Legs: When all that stands between death and freedom is a ride by Bonnie Silva. It was given to me by another rescue friend in the ‘bunderground railroad‘. Yes, there is a ‘bunderground railroad’. My friend is in the book – as one of the stories. I’ve now been part of 3 transports and it is a beautiful thing. The Rescue of “Joey”… ADOPTED!!! UPDATE 8/19/08: Joey’s story has a very happy ending. After coming into HRN care, he received veterinary attention (including being neutered), lots of love and has now been adopted. Yahhhhh Joey! I just wanted to let you know how the House Rabbit Network and employees from CBRE helped with a bunny rescue this past weekend. I don’t work with these groups and just met them, but just had to write to tell you this story. domestic bunny. While my sister and I tried to catch it, a gentleman leaving the building told us that a man had walked behind the building and dumped two domestic rabbits out of cages before running back to his car. We got really close a couple of times but the bunny proved to be too quick. After a couple of hours, we left some carrots and celery out and planned to come back in the morning to try again. 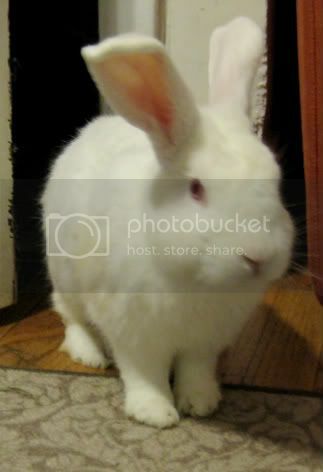 My sister found the House Rabbit Network online and sent them an email that night. Saturday morning, she received a call and email from Shannon, a HRN volunteer and bunny foster mom, who met us back at the office that morning to search again but no dice. Shannon and a team of HRN volunteers met back to the office park at dusk on Saturday to continue searching. After looking around in the swamp and woods, a domestic brown bunny was found stuck in an air intake vent that was surrounded by cement and metal grates. Look Closely: “Joey” sitting on a bucket in the concrete intake vent underground. This is the 3 inch opening mentioned below. There was no way into this space except a three-inch gap that the bunny had fallen through. 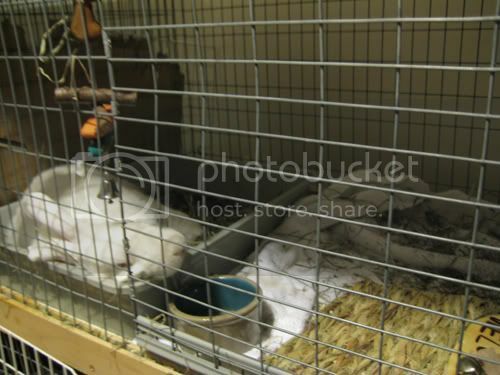 The bunny responded to food and water passed into the space and seemed to be healthy so a plan was made to find someone who could open up the grates so he could be rescued. Security contacted a maintenance man who brought his tools down and went to work opening up the metal shields. After hours of jig-sawing and prying, a hole big enough for a person to slide through opened up. Then people slid in through the opening and grabbed the feisty bunny. It was a long five hours, but totally worth it to rescue this sweet bunny (named “Joey). Joey will be taken to the vet for an exam and to be neutered and will be posted to the House Rabbit Network site when he’s ready for adoption. It’s sad that the white bunny is still not accounted for, but I’ll keep my eyes open. It’s even sadder that these innocent bunnies were literally dumped out into the wild by a man who didn’t want them anymore. These two bunnies were most likely Easter gifts that grew up too fast and were given a death sentence since abandoned bunnies can’t adapt from domestic life. They are most often hunted and eaten by predators or, as was the fate of the brown bunny before he was rescued today, get trapped and end up starving to death – a very slow and painful way to die. Special thanks to my sister Amy Ahern for finding and contacting the HRN for help; the HRN team of Shannon Cail, Tricia Hart, Tom McDonald, Suzanne Trayhan and Carol Youngclaus for volunteering to help rescue not just this bunny, but hundreds of bunnies in Massachusetts, New Hampshire and Connecticut; to Jeff Baker from security, Joe Voto and Chris Caruso from CBRE, and Amy Felicani (who slid into the air shaft) for their willingness to help rescue a bunny on a bug-filled Saturday night. Thank you all for saving Joey! Side Note: Joey was named after Joe Voto’s 6 year old son who told his dad that he had to leave dinner to go and save the bunny! “Joey” the bunny, is an approx. 3 lb., Jersey Wooley mix. Most likely a young “easter bunny” who was bought for children at Easter then released into the wild when the family and children lost interest.